proteins which host growth of undesirable microorganisms. Urine Off Multi-Purpose can be used aas a bathroom cleaner: tub, tile and grout, toilet, sink, floor, and walls. 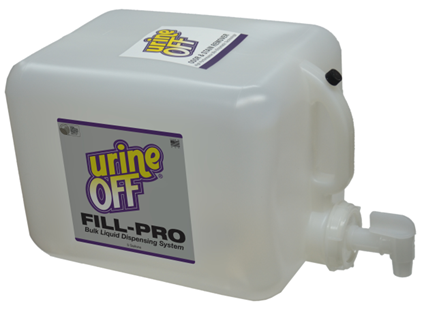 Easy to use, and effectively removes urine and its proteins as well as other soils. easy clean up of all problem areas. The Fill Pro concentrate makes five gallons that are conveniently stored in a sturdy container. The reusable, flow regulating tap, makes it simple to refill your bottles. Remove as much discharge as possible. Use Urine FinderTM Light to locate invisible deposits. Saturate soiled areas. 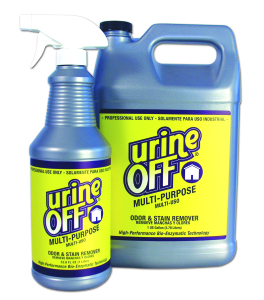 Urine Off must contact deposited urine to remove urine odor and stains. Agitate if on a hard surface. Allow time to work. For old stains, and build-up in grout, cover area with plastic sheet for up to 12 hours. Repeated applications may be necessary to eliminate heavy deposits. Scrub and rinse to remove residues. extractor to remove residues in the nap. Note: Store in cool location. выбор автомобиля по ценам вот такой.